More than 20 people were injured on Wednesday morning when a coach carrying travellers from Amsterdam to London crashed and overturned on the motorway in Flanders. Four people are currently still in hospital, one of whom remains in a serious condition. The accident took place at about 2.30 on the E40 near Aalter, between Bruges and Ghent. 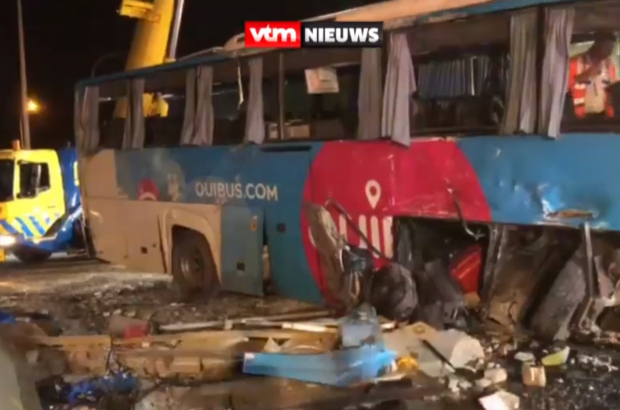 It appears the driver of the French-owned Ouibus coach did not see warnings of an obstruction in time and drove head-on into a concrete pillar. No other vehicles were involved. Two people were trapped in the wreckage and had to be freed by the fire service. The remaining passengers suffered minor injuries and were taken to local hospitals for treatment and then to a sports centre where they spent the night. Some of the passengers – including British, Irish, Afghan and Dutch nationals – then continued their journey while others returned home. A police investigation will examine the cause of the crash. According to a police statement, the Dutch driver had followed the rules on resting between journeys and had felt fine before the incident.